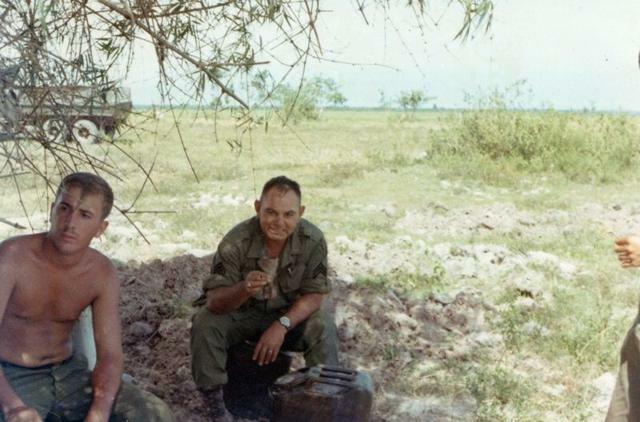 Ralph Thompson, the enlisted man in charge of FDC is on the left and George Martinez, chief of firing battery, with his ever present cigar and good spirits, is on the right. Both were good at their jobs and worked hard to make sure our battery fired accurately. We are sitting out in the open with no protection on a “fireball”, which meant moving out of our FSB for the day, supporting an infantry operation we could not cover from that FSB, and returning home that night. This spot became FSB Washington III some weeks in the future and we spent Christmas 1968 there.